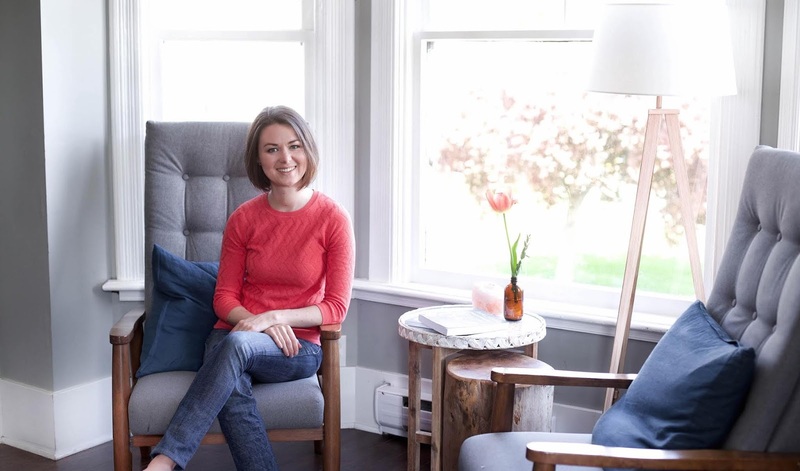 I am so excited for today's post: a Q&A in collaboration with Lily Nichols, RDN! 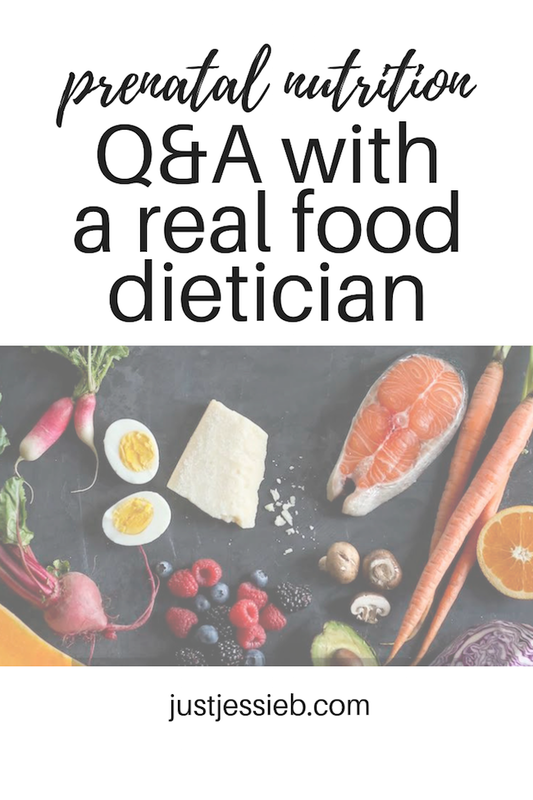 You guys sent me your top questions for a real food nutritionist who specializes in prenatal nutrition, and Lily is here to answer those questions! Lily Nichols is a Registered Dietitian/Nutritionist, Certified Diabetes Educator, researcher, and author with a passion for supporting pregnant women with evidence-based nutrition. Drawing from the current scientific literature and the wisdom of traditional cultures, her work is known for being research-focused, thorough, and sensible. I first heard her speak at Paleo f(x) in 2016 when Dathan & I traveled to Austin, TX to see what it was all about. She drew me in with her talk on carbs in pregnancy & the modern gestational diabetes epidemic- and that was years before I became pregnant myself! I'm so grateful to have her here to share with us today, and to answer your most important questions surrounding nutrition in pregnancy. 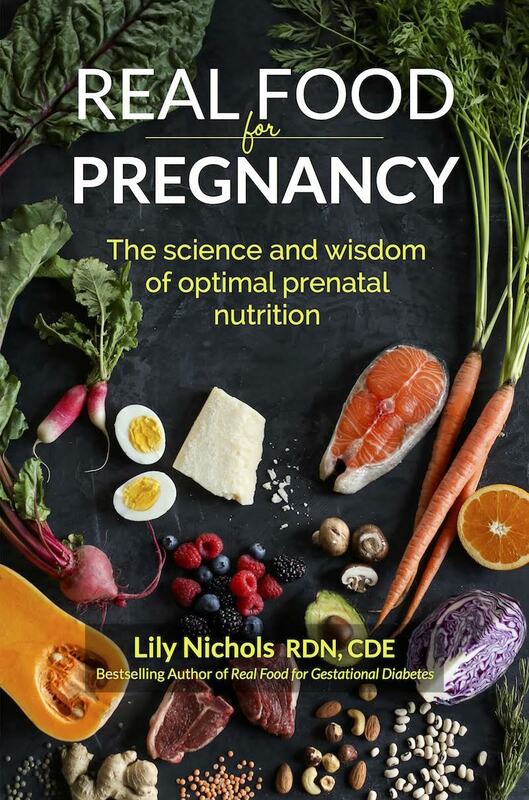 Be sure to check out Lily's newest book, "Real Food for Pregnancy: The Science and Wisdom of Optimal Prenatal Nutrition"- it's HERE on Amazon, and an amazing resource! What foods or supplements are helpful when trying to conceive? There’s actually a lot of overlap on foods and nutrients that are helpful preconception and during pregnancy. The 3-4 months leading up to pregnancy are a window for improving egg quality and enhancing your chances of conception (same goes for sperm quality, so get your partner on board!). It’s also helpful to emphasize more nutrient dense foods leading up to pregnancy in order to optimize nutrient stores prior to conceiving (and can be helpful for your peace of mind if you find yourself hit with really bad nausea or food aversions, see below). By the time you can confirm pregnancy, you’re already 4 weeks along (since pregnancy is dated by last menstrual period), so beefing up your diet now is really helpful to start your pregnancy with ample nutrient stores. Leafy greens. These serve as a major source of folate (that’s the real stuff, not the synthetic folic acid you see in supplements) as well as minerals, including magnesium and potassium, fiber, vitamin C, beta-carotene, and many antioxidants. The word “folate” comes from the word “foliage” after all! Kale, spinach, chard, collard greens and romaine lettuce are a few examples. Seafood. This provides important nutrients like iodine, DHA, and selenium, which are often difficult to obtain elsewhere in the diet. Both of these nutrients play a fundamental role in brain development, which actually starts very early on in pregnancy. Iodine and selenium are specifically supportive of your thyroid gland in pregnancy, which is under a lot of stress as it’s tasked with pumping out 50% more thyroid hormone than it usually does. What can you eat to combat nausea? Tips for first trimester "morning sickness"? Finally, cut yourself some slack. There are many plausible theories for why nausea happens so frequently (I cover them in Real Food for Pregnancy). Set the bar low right now and just get through it however you can. If the only thing you can eat is bread and butter, it’s better than nothing! I promise. What are your thoughts on collagen during pregnancy? I’m a fan of it, as long as it’s sourced from pasture raised/grass fed animals and is from a reputable company. I encourage people to get nutrients from food as much as possible, but when it comes to the amino acids found in collagen, especially glycine, many women aren’t getting enough unless they eat bone broth, tough cuts of meat (like you’d make in your slow cooker - think pulled pork or beef stew), poultry with the skin (such as chicken wings), or pork rinds on a very regular basis. In situations where this isn’t happening, collagen powder can be a valuable addition to the diet. The rationale is that glycine is required for fetal DNA, skeletal development, the formation of connective tissue, and the development of your baby’s internal organs. It’s also key for your own stretching skin (especially bigger belly and breasts), growing uterus (estimated to contain 800% more collagen at the end of pregnancy than it did prepregnancy), integrity of your pelvic floor, and health of your connective tissue. In short, it’s good stuff! What are your thoughts on kombucha during pregnancy? I personally don’t have a problem with kombucha consumption as long as you’re choosing a kombucha that has a relatively low amount of sugar (read labels, friends!). I think it’s a helpful way to add probiotics to the diet. I think the concern about kombucha potentially being harmful is from the alcohol content and/or the risk of food poisoning. As far as alcohol content, commercial kombucha has less than 0.5% alcohol. That’s less than what you find in overripe fruit and far less than something like a beer, which has 5%+ alcohol by volume. From a food safety standpoint, kombucha that is properly made is fermented long enough to become slightly acidic, which naturally prevents unwanted microorganisms from multiplying. I’ve never seen a food safety outbreak linked to kombucha and yet raw produce (mostly leafy greens and fruit) is the cause of almost half of foodborne illness outbreaks in the US. I think the food safety concerns for pregnant women are overblown and misplaced. If we were really being cautious, we’d ban pregnant women from consuming salads and pre-cut produce! I share more detail on my frustrations on “foods to avoid” in chapter 4 of Real Food for Pregnancy. There’s a lot of nuance to this topic, for sure. We need common sense on food safety without perpetuating unfounded fears. Can eliminating food groups, like dairy, negatively affect the baby? Eliminating certain foods always brings the risk of missing out on essential nutrients, so you want to be smart about what you’re avoiding and why. A lot of it depends on the remaining make up of the diet. If you were to avoid dairy, you would be eliminating a source of vitamins A, D, and K2, riboflavin, iodine, protein, and probiotics. If your diet did not contain any fermented foods other than yogurt, that could be an issue. Or if you really don’t like seafood, then the iodine from dairy products may have been very important (besides seafood, eggs and dairy are the major sources in the US diet). If you don’t eat natto (a fermented soy product from Japan), then you might not be consuming much vitamin K2 anymore. Of if you are averse to green vegetables at the moment, don’t like almonds, and any of the other calcium-rich foods, maybe dairy was an important source of calcium for you. These may or may not be issues, but it all depends on the rest of your diet as well as the supplements you take. There are many ways to make a real food prenatal diet work. You just have to consider the nutritional trade offs with whatever you choose. And full disclosure, I think it’s absolutely possible to meet the nutrient needs of pregnancy dairy-free. I just wanted to give you an example of my thought process when considering avoiding certain foods and how to make up for any nutritional gaps. If you eat a balanced diet, do you really need prenatal supplements? You can probably guess from my answer to the above question that it depends. First of all, we need to define what we mean by “balanced” since that means very different things to different people. For me, I would only consider skipping supplements entirely if I could ensure the micronutrient content of my diet met or exceeded all the RDAs for nutrients in pregnancy (that practically requires daily consumption of leafy green vegetables, eggs, and meat (and probably dairy products), weekly consumption of several servings of seafood and bone broth, and occasionally having liver. Plus, I’d want to ensure I was living at a latitude where I could have regular, year-round sun exposure to maintain my vitamin D levels at optimal levels. This is simply not the case for most people, whether due to food preferences, aversions, where they live, finances, or just life getting in the way! There can also be genetic differences in the way our body handles nutrients that can make it difficult to maintain optimal levels of certain nutrients. For example, the MTHFR mutation (which 40-60% of us have) may influence your needs for folate, vitamin B12, B6, zinc, choline, and glycine. There are many, many reasons that it makes sense to have the insurance policy of a prenatal vitamin and some carefully selected supplements (again, for most people). This is where working with a well-trained practitioner can be helpful. What are some foods/nutrients to focus on by month or trimester to support baby's development? From the data, here’s what I can say with some confidence: During the first trimester, nutrients that support methylation are key in the prevention of neural tube defects and other birth defects. The basic structure and placement of organs is all completed by week 8 of pregnancy. This is where folate, vitamin B12, B6, zinc, choline, and glycine really shine. Food sources of the above include liver, eggs, red meat (especially meat on the bone), seafood (especially oysters and shellfish), leafy greens, avocados, legumes, and nuts/seeds. Note that vitamin B12 is only found in animal foods. In late pregnancy, your baby is accumulating weight at a much more rapid pace. The transfer of fatty acids is at an all time high at this stage, so being particularly carefully to consume enough DHA and fat-soluble nutrients makes sense (seafood, algae-based DHA, unprocessed fats from animals and plants, like lard, tallow, butter, eggs, avocado, coconut, etc.). This is also when supporting the growth of the baby’s bones (and ensuring your skeleton can support all this extra weight!) is helpful. For this, think calcium, magnesium, vitamin D, vitamin K2, and glycine. Iron needs are also increased in late pregnancy and is when most women become anemic. Heme iron from animal foods is best absorbed and found in abundance in liver, oysters, red meat, chicken/turkey thighs, and organ meats. Technically, you can make the case for all of the above nutrients and foods at any time point in pregnancy, but hopefully this helps you zero in on some foods to be especially mindful at different stages of pregnancy. I obviously did not cover all nutrients or all foods, but that’s why I have a super detailed book on the topic! 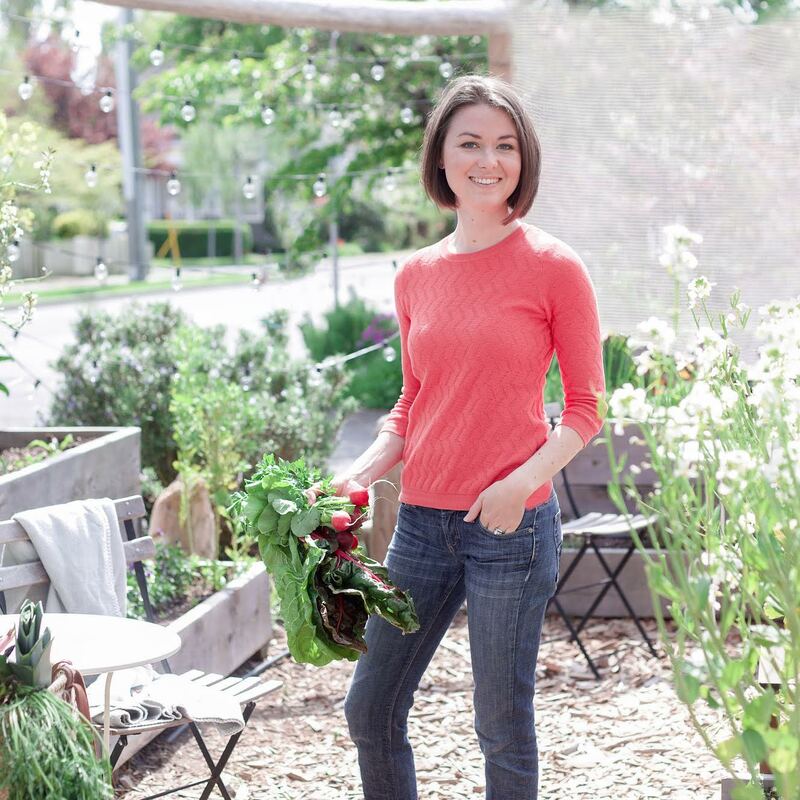 For those who want to dive in to food sources of nutrients and how all of this synergistically comes together to support a healthy pregnancy, check out my book, Real Food for Pregnancy. I give away the first chapter for free over at lilynicholsrdn.com. Don't forget to shop Lily's book HERE on Amazon! & Thank you so much to Lily for sharing her knowledge with us!! I'm so excited for this post to serve as a resource for you guys (and myself too)! That's a good information for every prenatal. You have given good diet and also good suggestions. I suggest prenatals to follow this diet to keep healthy and prevent themselves from pre-pregnancy diseases. Keep up lily.